Undergraduate students at UC San Diego gather on deck earlier this week to look at specimens brought up for the Marine Biology Laboratory course known as SIO136. 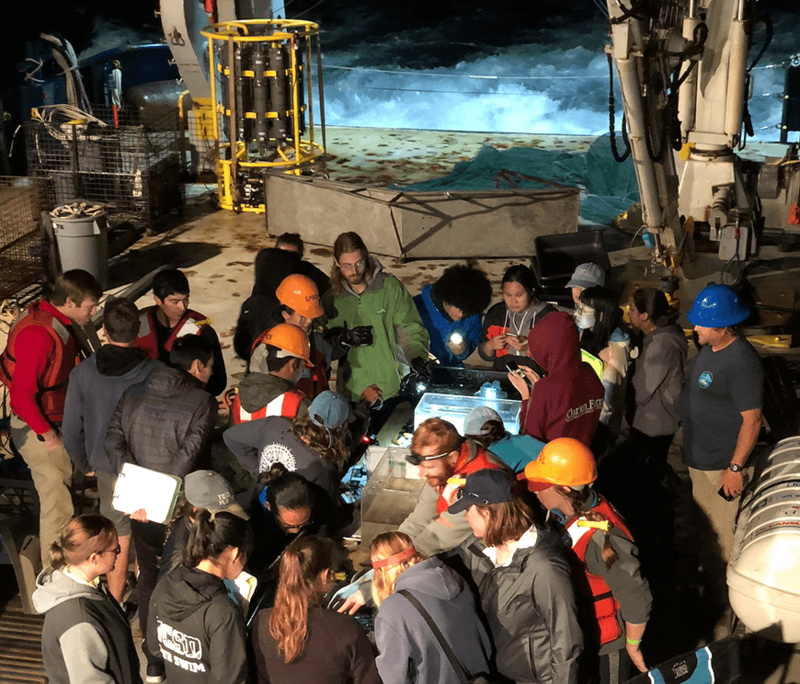 "No one sciences as hard as @Scripps_Ocean undergrads on R/V Robert Gordon Sproul," Scripps Oceanography marine biologist Brice Semmens commented in one of his tweets about the cruise, joking later: "It's 8 p.m. They've been on the ship since 7 a.m. But the mid-water trawl just came up, and I can't get close enough to see anything because all these damned @Scripps_Ocean undergrads are in the way. " The 12-hour cruise is intended to give undergraduate students experience aboard a research vessel and familiarize them with the instruments and tools used to collect oceanographic data and specimens while at sea. Specimens brought up by the mid-water trawl and a shallower trawl on this cruise included California king crabs, giant Pacific octopuses, sea stars, rockfish, and what Scripps Marine Vertebrate Collection Manager Ben Frable dubbed on Twitter an "amazing female Pacific Dreamer, Oneirodes acanthias!" More photos from the cruise are posted on the Facebook page set up for the course. admin. Photo of the Week: Night Trawlers. 2018-11-02.